As Red Moon continues to make waves, Kim Stanley Robinson continues to produce articles raising the alarm bell for action on ecological sustainability and social justice, and arguing for world civilization to change direction towards a "Good Anthropocene". That future would, in effect, be the story of humanity devoting itself to nurturing the health of the biosphere and creating a sustainable prosperity for all the living creatures on this planet. While not exactly utopia, that future could be called optopia—the "optimal place," the best possible outcome given the current conditions. […] "Geo-engineering" is a misnomer. It would be more appropriate to call these attempts at planetary remodeling by another name: geo-tweaking or geo-finessing or geo-begging. These terms better indicate how puny civilization's powers are relative to giant forces such as the chemistry of the oceans, the balance of the atmosphere, and the interplay among millions of species. […] Perhaps the most important thing we can do to adapt to climate chaos and the dislocations of the Anthropocene is to rethink the assumptions and revise the rules of corporate capitalism. After all, the current economic order, while massive, isn't permanent or unchangeable. It's a human artifact: We made it over time through a series of power plays and improvisations. And that means we can remake it, if we have the courage to do so. […] Essentially, we as a society would be deciding to pay ourselves to do the work needed to create a good Anthropocene. An ecology-minded quantitative easing would be its own kind of geo-engineering. Some are calling this the Green New Deal. the other vast, undeniable truth that goes hand in hand with the reality of our changing climate — the crux and cause of the problem — is that we live under a global capitalist system, in which the market rules. And that system’s oversimple algorithm, which measures priceless things in terms of quarterly profit and shareholder value, is mindlessly chewing up the biosphere and the lives of everyone in it. […] So climate change and capitalism are two parts of the same problem; they are effect and cause. And capitalism is not only driving climate change, but also our response to it — by influencing government policy, and the development of new technology, and our basic understanding of the options open to us as we fight for a planet that can sustain life. We need to fix our economic systems, meaning our political systems, in order to fix climate change. […] There are even some earlier forms of capitalism that might provide tools we can repurpose. In the system of neoliberal capitalism, as theorized by Milton Friedman and Friedrich Hayek, and legislated in the US and UK during the Reagan/Thatcher years, the market makes our policy decisions. This 40-year experiment in political economy has been a disaster. But before the neoliberal turn, there was Keynesian economics […] Government was seen as not just necessary, but good. […] After these first steps — carbon taxes, the Green New Deal, carbon burn reductions based on the Paris Agreement — things get murkier, but the trajectory of improvement would make the next steps clearer. And the measures needed to stabilize our climate and avoid a mass extinction event (regenerative agriculture, carbon capture, wildlife stewardship, Mondragón-style co-ops) could lead to — and would require — changes that would create a more sustainable and just civilization: equal rights for women, progressive taxes, universal basic incomes and health care, public education for all, and the return of real political representation. Optopia as the obtainable utopia? In another article for Commune Magazine, Robinson discusses the concepts of dystopia and utopia and their Greimas rectangle opposites (where the top illustration here comes from): "Dystopias Now". dystopias today seem mostly like the metaphorical lens of the science-fictional double action. They exist to express how this moment feels, focusing on fear as a cultural dominant. A realistic portrayal of a future that might really happen isn’t really part of the project—that lens of the science fiction machinery is missing. […] For every concept there is both a not-concept and an anti-concept. So utopia is the idea that the political order could be run better. Dystopia is the not, being the idea that the political order could get worse. Anti-utopias are the anti, saying that the idea of utopia itself is wrong and bad, and that any attempt to try to make things better is sure to wind up making things worse, creating an intended or unintended totalitarian state, or some other such political disaster. […] As Jameson points out, it is important to oppose political attacks on the idea of utopia, as these are usually reactionary statements on the behalf of the currently powerful, those who enjoy a poorly-hidden utopia-for-the-few alongside a dystopia-for-the-many. This observation provides the fourth term of the Greimas rectangle, often mysterious, but in this case perfectly clear: one must be anti-anti-utopian. From the global to the more local. Robinson was a keynote speaker at a gathering in Sacramento, in October, organized by UC Agriculture and Natural Resources and UC Water, on outreach for water and climate research. "There is a strange disconnect between what the scientific community is telling the world and what the world is hearing. As a result of data analysis, science is announcing to the world there is climate change. Individuals cannot perceive climate change. Show them in ways that can be understood by the senses. The story has to be told with pragmatism and common sense." Turning to interviews, the Chicago Review of Books interviewed KSR about Red Moon: "Kim Stanley Robinson's Lunar Revolution". The question these days, I think a question that is worldwide, expressed in different places and their different systems, is this: does anyone feel truly represented by their government representatives anymore? As different as China is from the US politically, and the EU is different in another way, that question keeps popping up. Wang Hui calls it “the crisis of representation.” No one is confident they are really represented politically any more, no matter the country. So that was something I wanted to explore in Red Moon—might a moment come when populations in different countries reacted against their governments, or against global finance, at the same time? What would that look like? […] A couple of real stories merged for me in the story of Ta Shu’s mother. And I like the birth scene in the book. The point of view of a deeply inexperienced male observer trying to help was easy for me to imagine, having been there myself long ago. And my neighbor and friend Djina is a midwife and gave me lots of good help with imagining some of the lunar ramifications, so to speak. […] Writing Red Moon brought me face-to-face with the feeling that China is hard to understand, maybe impossible to understand. I wanted to write that feeling down in some detail. Then also, writing the book gave me another time with my character Ta Shu, whom I had so much enjoyed in my novel Antarctica. And it gave me Fred and Qi and their relationship, not one I had encountered before. I don’t know if that’s a change in perspective or not. In this recent podcast for Mendelspod, on the occasion of the announcement of gene-edited babies using CRISPR, KSR discusses the enhancement on humans in his novels (see Blue Mars, 2312) and argues that we wouldn't quite know how to approach the problem of doing better than evolution, as far as human cognitive enhancements are concerned. I have never read a definition of the word “libertarian” that makes any sense to me, nor sounds attractive as a principle, so I avoid that word as much as I can. Maybe “democratic socialism” is the better term for me — the idea being that people in democracies would elect representatives that would then pass laws based on socialist principles. […] There would be more steps later. I usually favor stepwise reform, but I have to admit we need the steps to come really fast, one after the next, now that climate change is about to overwhelm us. […] we need the state itself to become just and scientific, and the expression of everyone alive agreeing how to live together. That agreement formalized as laws becomes the state…. Best to focus on creating a good state based on just laws. For getting through the climate change emergency, I think it’s the only way that will work. 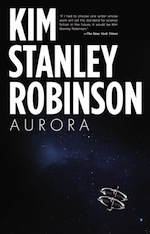 Robinson’s insistence, through a career spanning more than 30 years, that human ingenuity can open up compelling new forms of life in and against the harshest circumstances and environments, makes him one of the most consistently interesting radical writers working today in any genre. […] In other words, he favours doing what works. Red Moon makes repeated approving references to China’s pragmatic, eclectic energy policy, with its massive land restoration programmes and selective use of nuclear power. […] For Robinson, there is no pristine wilderness. Life survives through relentless adaptation. But the cautious planetary engineering he advocates is closer in spirit to Fabian technocracy than Soviet prometheanism. Indeed, the Red Mars series offers perhaps the most exhaustive account in literature of the process of transforming another world, and the ethical questions it raises. KSR's article for his second visit to Antarctica, "Nightmare on the Ice" for Smithsonian Magazine was awarded by the Society of American Travel Writers Foundation! "Typescript of the Second Origin" by Manuel de Pedrolo, written in 1974 in Catalan, a post-apocalyptic tale of survival and safeguard of cultural heritage, was re-published in 2017 as a trilingual new edition for which KSR wrote the foreword. "Solar Bones" by Mike McCormack, an elegiac novel set in modern-day Ireland written in a single sentence, recommended by KSR in this podcast by Bookriot. "Short Cuts", a short text by Billy Beswick that was just published at the London Review of Books. WeChat, Marxist Society, Utopia, migrant workers, hukou -- it describes some aspects of a fast-changing daily life in China and the disorientation of being a Westerner there, in a similar way to what KSR did in Red Moon! Kim Stanley Robinson's next novel, "RED MOON", is set for publication in hardcover by Orbit in October 2018 (October 23 for US, October 25 for UK). Remember Ta Shu from Antarctica? Refresh your memory because he is back! Remember the quantum AIs from 2312? Prepare to meet their ancestors! You might also want to have a crash course in pinyin. And no, this is not the zany George "Freds" Frederickson from Escape From Kathmandu! The cover was revealed by Orbit in March, and was designed by Lauren Panepinto. Someone had told him not to look while landing on the moon, but he was strapped in his seat right next to a window and could not help himself: he looked. Quickly he saw why he had been told not to—the moon was doubling in size with every beat of his heart, they were headed for it at cosmic speed and would certainly vaporize on impact. A mistake must have been made. He still felt weightless, and the clash of that placid sensation with what he was seeing caused a wave of nausea to wash through him. Surely something was wrong. Right before his eyes the blossoming white sphere splayed out and became a lumpy white plain they were flashing over. His heart pounded in him like a child trying to escape. It was the end. He had seconds to live, he felt unready. His life flashed before his eyes in the classic style, he saw it had been nearly empty of content, he thought But I wanted more! “Moms worry too much,” the old man said. “Have you done this before?” Fred asked, hoping the old man could provide some insight that would save the appearances. In other news: New York 2140 has been nominated for both Hugo and Locus Awards!